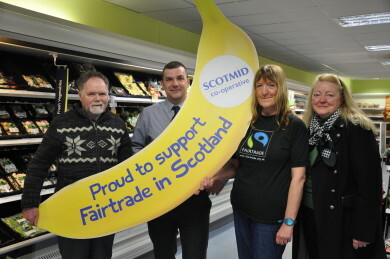 The Queensferry Fairtrade Group helped launch Fairtrade Fortnight at Scotmid South Queensferry. "This Fairtrade Fortnight, we want to inspire our local communities to choose Fairtrade to help transform the lives of farmers and producers in the developing world." Scotmid Co-operative is asking communities across Scotland to go bananas for Fairtrade Fortnight, which kicks off across the UK today until 9th March 2014. Scotmid is promoting Fairtrade Fortnight at its stores across Scotland, with activities and special discounts planned to encourage local customers to support Fairtrade. Scotmid stocks Fairtrade products such as tea, coffee and chocolate in all of its stores and only sells bananas that are certified Fairtrade. Schools will be visiting their local Scotmid store during Fairtrade Fortnight to learn about the importance of making informed choices about products when shopping, and to try Fairtrade products. Scotmid is also holding an art project with local primary schools, which asks pupils to draw ‘what Fairtrade means to me’ on wobbly signs that will be displayed in their local store next to Fairtrade products. Montrose Fairtrade Forum marked the start of the Fortnight at Scotmid Borrowfield. Scotmid is supporting a number of Fairtrade events across the country, including a Fairtrade football festival in Angus and a Fairtrade fashion show in Edinburgh. To encourage customers to choose Fairtrade, Scotmid stores will be offering a 20% discount on many Fairtrade products including tea, chocolate and wine during Fairtrade Fortnight. Strathaven Fairtrade Group visited Scotmid Strathaven to promote Fairtrade Fortnight. 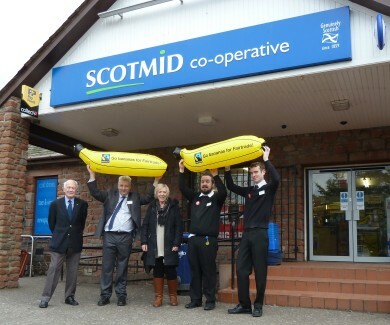 “Scotmid Co-operative has been a supporter of Fairtrade for over 15 years. We are very proud to have been the first Scottish retailer to stock Fairtrade products in our stores, and we continue to champion the Fairtrade movement today. This Fairtrade Fortnight, we want to inspire our local communities to choose Fairtrade to help transform the lives of farmers and producers in the developing world. She added: “Our staff will be encouraging customers to switch to a Fairtrade version of food cupboard essentials like tea, coffee and fruit, and we will be running a special promotion on Fairtrade products to raise awareness of the campaign. In our local communities, our staff will be giving talks to local schools about Fairtrade, helping out at Fairtrade coffee mornings, and giving away lots of Fairtrade bananas – which are the only type of bananas we sell in our stores. 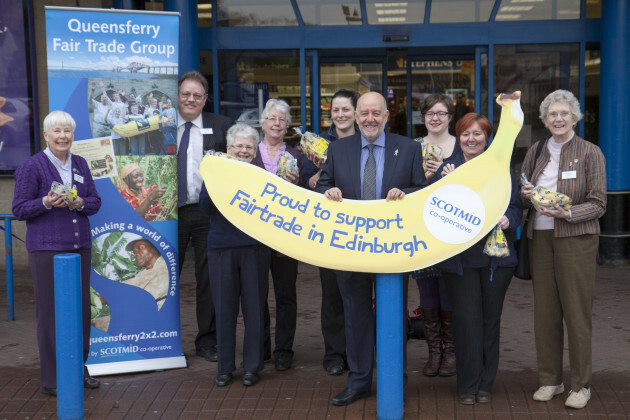 Find out more about Scotmid’s work supporting Fairtrade.